​Wasn’t the Ka Iwi Coast/Sandy Beach already saved? How were the Ka Iwi Coast Mauka Lands protected? For over a decade, Livable Hawaiʻi Kai Hui through its Ka Iwi Coalition members were vigilant and rallied against successive golf-course and vacation cabin development proposals. In 2012, these community groups enlisted the help of national non-profit The Trust for Public Land, to work on voluntary land conservation strategies. The Securities Exchange Commission sued the private developer that owned the land and the court appointed a receiver in Utah to sell the land to pay of the developer’s creditors. The Trust for Public Land was able to negotiate a land purchase agreement with the Utah receiver. In 2014, Livable Hawaiʻi Kai Hui and The Trust for Public Land jointly applied for State Legacy Land Conservation Program and City and County of Honolulu Clean Water and Natural Lands Program funding, and later raised private funds to purchase the property. Over 1,600 generous donors and volunteers stepped forward in a historic fundraising campaign raising over $600,000 in under four months. had fought so hard to preserve. How much did the land cost? The Trust for Public Land. When a landowner transfers a conservation easement to a government agency or land trust, the landowner voluntarily gives up some of the rights associated with the land. For example, a landowner might give up the right to build additional structures, while retaining the right to grow crops. Future owners also will be bound by the easement's terms. The government agency or land trust is responsible for making sure the easement's terms are followed on a long-term basis. ​​Can the conservation easement ever be removed? if the land is transferred in the future, the conservation easement will always restrict development. It is extremely difficult to remove or dissolve a conservation easement. ​How can the public access these lands? after completing surveys and establishing safe access. What is Livable Hawai'i Kai Hui and what is its role? What is The Trust for Public Land and what is its role? self-sufficiency, and lands that perpetuate Hawaiian culture. Since 1979, we have helped to conserve more than 43,600 acres on the islands of Hawai‘i, O‘ahu, Kaua‘i, Maui, and Moloka‘i. the land with the City and County of Honolulu. More information available at www.tpl.org/hawaii. What is the State Legacy Land Conservation Program? The State Legacy Land Conservation Program was established in 2005. It sets aside up to 10% of the real estate conveyance tax – a tax paid when land is sold – for conservation of lands with cultural, natural, and agricultural resource value. The program is housed with the Department of Land and Natural Resources, Division of Forestry and Wildlife. 22,580 acres of land have been approved for protection, with 43 projects awarded funding, with the State contributing only 1/3 of the effective cost of the land. Grants from the program are competitive. A volunteer Commission considers and ranks grant applications, consults with the Speaker of the House and the Senate President, and make recommendations to the Board of Land and Natural Resources, which votes to approve the grants. If you would like to contribute to future stewardship of the Ka Iwi Coast Mauka Lands, you can donate to Livable Hawaiʻi Kai Hui, noting “Ka Iwi Coast Mauka Lands” on your check. volunteer opportunities happening along Ka Iwi Coast. Mahalo for your interest and care for Ka Iwi Coast! Yes, The Livable Hawaii Kai Hui is a 501(c)3 organization and all donations to The Livable Hawaii Kai Hi are fully tax deductible. How much of my donation actually goes toward the land purchase and stewardship? 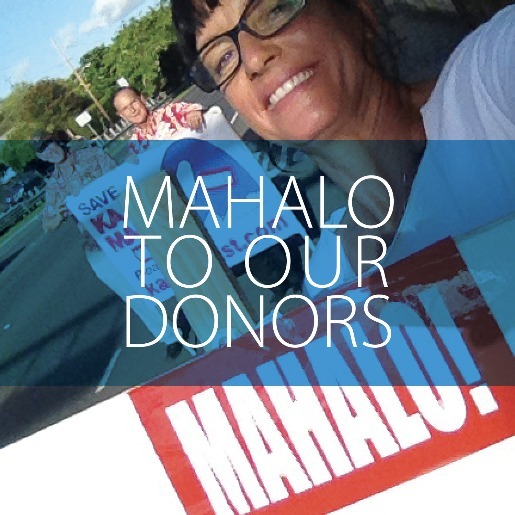 100 percent of your donation goes toward the purchase and stewardship of the Ka Iwi Coast Mauka lands. What happens now that the goal has been met by the August 30, 2015? The Livable Hawaii Kai Hui and The Trust for Public Land are working with the city and state to ensure that the deadlines are met to pursue the purchase. The nonprofits are in discussions with the city and state to get the proper documents in order to ensure a timely closing on the property. Any additional funds not used for the purchase will go toward the stewardship of the lands, surveying and cataloging cultural sites and native species. What if more than $500,000 is raised? Where will the excess funds go? 100 percent of the funds over $500,000 will go to Livable Hawaiʹi Kai Hui for the limited purpose of stewarding the Ka Iwi Coast Mauka Lands. These funds could be put toward general land management expenses such as property taxes (until a nonprofit property tax exemption is approved) and liability insurance, and could help to fund important stewardship needs such as an archaeological inventory survey. How will the land title will be held? As a conservation easement or an outright purchase? The Livable Hawaii Kai Hui, a 501(c)3 community nonprofit, and will purchase the land in fee. The deed will be held by Livable Hawaiʹi Kai Hui and will include a restriction from the State Legacy Land Conservation Program that will restrict development. Immediately after thetitle transfers to Livable Hawaiʻi Kai Hui, the nonprofit will transfer a conservation easement to the City & County of Honolulu toplace an additional layer of protection over the lands. A conservation easement is a legal agreement between a landowner and a government agency or land trust that permanently limits uses of the land in order to protect its conservation values. The term ‘conservation easement’ can be confusing because people often think of a road in relation to the word easement. A conservation easement is not a road or path, but rather a permanent legal agreement that restricts how the property can be used in order to protect its conservation values. When a landowner transfers a conservation easement to a government agency or land trust, the landowner voluntarily gives up some of the rights associated with the land. For example, a landowner might give up the right to build additional structures, while retaining the right to grow crops. Future owners will also be bound by the easementʹs terms. The government agency or land trust is responsible for making sure the easementʹs terms are followed on a long‐term basis. For the Ka Iwi Coast Mauka Lands, the conservation easement will likely be held by the City & County of Honolulu. The conservation easement will restrict development and likely require that public benefits in addition to the undeveloped viewplane be provided, such as educational and cultural visits by school and community groups, and the requirement or a cultural survey. Can the conservation easement ever be removed? The conservation easement will restrict development and likely require that the public benefit from more than just the beautifully undeveloped view planes. This will allow for educational and cultural visits by school and community groups, but first a highly-anticipated cultural survey will have to take place. Who are Livable Hawaiʹi Kai Hui and Ka Iwi Coalition and what are their roles? The Ka Iwi Coast Mauka lands will be owned by the 501(c)3 nonprofit Livable Hawaiʹi Kai Hui. The Livable Hawaiʹi Kai Hui stewards special natural places in Maunalua including Kamilonui Valley, Pahua heiau, the Hāwea heiau complex and Keawawa wetland where it is also the owner. The Livable Hawaiʹi Kai Hui’s motto is sensible growth and respect for the land. One of Livable Hawaiʹi Kai Hui’s committees is the Ka Iwi Coalition whose volunteers have been advocating and working to protect Ka Iwi Coast for 40 years. More information on Livable Hawaiʹi Kai Hui can be found at www.hawaiikaihui.org. Mahalo for your interest and care for Ka Iwi Coast.